RE: Why does El Nino peak during winter? Great question! There certainly is a seasonality to El Nino which involves the atmospheric/ocean circulation leading to a peak in winter. This is an active area of research so I am afraid I cannot give you a more exact answer. RE: RE: Why does El Nino peak during winter? Thank you for responding. May I suggest an entire post giving the scientific explanation for why El Ninos typically peak at the end of the year. If this is an active area of research, then tell us what the current thinking is. This is after all the ENSO blog. If the models predict a peaking of Nino3.4 in the late fall, early winter and past historical data shows this to be true, then what information is going into the models? I was a bit hesitant at first to ask this question here because I'm not sure if it applies to ENSO, but I can't seem to find the answer anywhere else so here goes.. I've read a lot about the "period of uncertainty" (my paraphrase) in the northern hemisphere spring and how you have to get past that period to have the best possible chance of seeing a clear ENSO picture for the following fall/winter. When it comes to long range forecasting in general, is there also a period of uncertainty in the northern hemisphere autumn as well? Or is it only spring? Thanks for this nice site, but I do have a bone to pick with you - when presenting potential effects of a "Strong" El Nino, 65-66 does not qualify as one, as for example, it ranks as having only the 7th lowest SOI value and the 9th warmest Nino 3.4 value (based on ERSSTv4 data) of all events since 1950. I rank this as a moderate event. My point is that if you are going to describe the potential effects of a strong El Nino, you need to limit that discussion to only those events, otherwise it is misleading - a lot of this is going around these days. The recent strong events were: 82-83 and 97-98 and perhaps 72-73, 91-92, and 57-58, depending on your method of classification. And as you know, only two of those were in the super category - 82-83 and 97-98 - these two deserve a special place for themselves and they both produced very similar effects across the Pacific. Comparing 82-83 to 65-66 is just not a good fit. It remains to be seen just how strong this event will get this year. It is trying to be strong and the model predictions of Nino 3.4 definitely show a very strong event, but we shall see. Thanks for your comment. At the Climate Prediction Center, we use the Oceanic Nino Index (ONI) as the determination for the strength of the event. We do not have a super category. 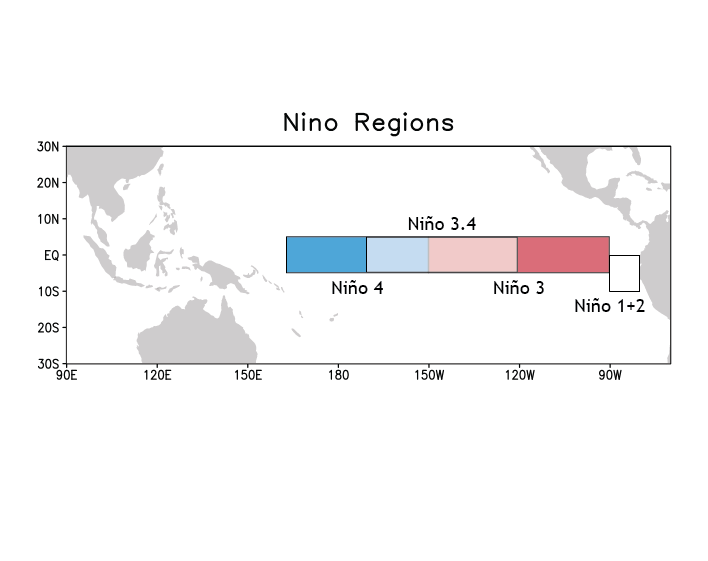 We recognize that others may determine the strengths of El Nino events differently. hello fellow readers - all those of you asking "what is going to be the effect of XYZ climate phenomenon in ABC location on PQR date" should slow down and reread the WHOLE post and ALL the comments. Because the short answer to your questions is "no one can know for certain." There are changes in the likelihood of certain events but as the authors point out (repeatedly and patiently) nearly opposite effects could occur as a result of ENSO because of the myriad interactions with other phenomena." Interestingly the forecast models don't currently show a strong precipitation signal for Northern California. Can you point me in the direction of any way to explain what's happening on Mexicos south pacific coast? We're dyin' here. Temps reaching 100, 80% humidity, and no rain! Where are our nightly thunderstorms? Forecasts will call for 80% chance of rain! then it evaporates. What happened to our hurricane season? It started early and then stalled. The few that are forming seem to be forming west of us, leaving us in the (dry) lurch. Is this related to the El Niño pattern? Cause there'll be no Diwali here, either, if we don't get our rain.. Thanks for all the cool stuff you do! Hello, if we doubled the number of Pacific Ocean marine weather monitoring buoys, would it improve our forecasting accuracy noticeably? Does the 11 year solar cycle have much effect on El Ninos ? My parents are on a cliff in Dana Point, Ca and I am in Northern Ca I need to know how we will be affected when this hits and how long is it going to rain for? Sorry I don't understand all the mumbo jumbo technical science terms so if someone could explain in English that would be helpful. I am planning a very expensive Galapagos cruise Easter week. I will be taking two children ages 10 and 12. How will El Nino impact the environment? What can we expect regarding weather, wildlife viewing, etc? Should I postpone this trip for a year or more? I want this to be a positive experience for my children. How Well El Nino in 2015 Effect Western Wisconsin and how well this effect us getting hit, what well the weather be like. well many be likely not able to survive this? What can we expect in the 2015-2016 winter season in Northern Arizona high country where elevations are in the 5000' to 7500" foot range. My mom and I are planning a trip to the Yucatan for February 2016 and she's worried it's going to rain a lot or they'd get hurricanes. What will the weather be like in that region during El Niño? The first thing to say about this blog is how well it is written. No Mysto-crypto-tech jargon, so common in many disciplines. A huge thank you to authors. You actually want first and foremost to communicate - not hide and nuance things, and impress readers with your knowledge . This is deeply appreciated. Will El Nino affect Baja Californnia as it would effect So Cal ?????? What is the projected effect on the west coast of Mexico, Mexico City and the Yucatan in February-March 2016? What normally happens to Caribbean tradewinds when el nino is strong?